Members who make a Pilgrimage to the Holy Land are encouraged to record the spiritual impact the experience has had on their faith and to their commitment to the principles of the Equestrian Order. Here are some of our members’ reflections. Earlier, in October 2016, we joined six other Area Councillors and Cardinal Roger Mahony and his family on a wonderful pilgrimage to the Holy Land that put us all on a spiritual whirlwind. We credit Cardinal Mahony and our fellow 27 pilgrims with providing us the impetus to answer the call to be Group Coordinators for Catholic Travel Center and our own Las Vegas EOHSJ for another pilgrimage: April 9-20, 2018. What followed was a small glimpse of what proved to be the spiritual adventure of our lives…at least as of April 20th, 2018. We planned for nearly a year and filled up the 44 spots in record time. We had a pent up demand and were excited that nearly 60 percent – 26 Pilgrims – are KHS members and future investees. Thirteen members received their Pilgrim Shells from the Latin Patriarch and seven, who will be invested in Orange County, will also receive theirs. While majority were from Las Vegas, we had KHS members from San Diego, Los Angeles and from the Northwest Lieutenancy (San Francisco and Reno)! Our ages ranged from 13 (thanks Gia Rogers) to 82 (unnamed!). There are many adjectives to describe these 12 days, but for us, the big phrase was spiritual awareness. Weeks before, we sent videos and updates each Friday to the 44 Steppers and felt the momentum and excitement growing…why not? After all, we had Bishop Joseph Pepe, and two Las Vegas priests, Fr. Ron Zanoni and Fr. Jim Jankowski, to lead us spiritually. 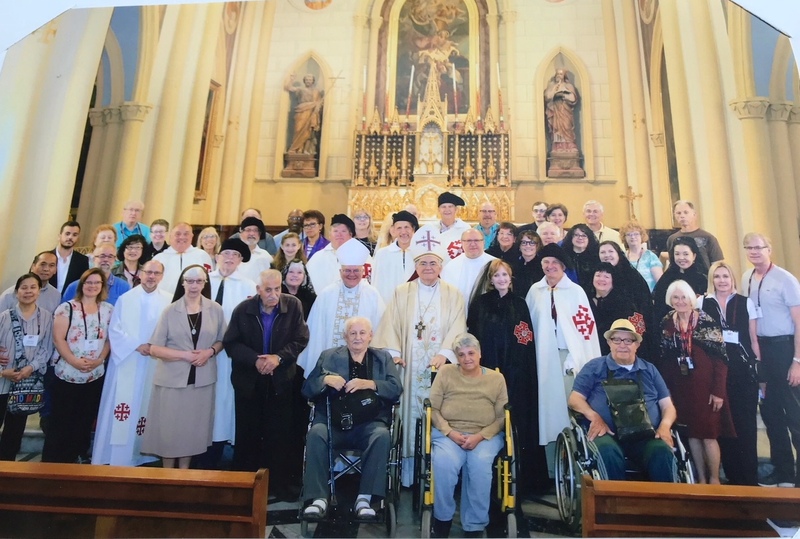 The daily reflections and homilies along with the pilgrims’ duties as Eucharistic Ministers, Lectors, Rosary leaders, Collectors and Sweeper Cabooses made this a galvanized team. And, we also had Mathew, Mark, Luke and John with us. Thanks to Deborah Barton, Julie Mersch, Jim Burgess and George Rogers. Added to this was the finest Holy Land guide we had experienced, Gabriel Makhlouf (son of recently deceased Rimon, KHS, and #1 rated guide); our team was wired or should I say BLEST! The foundation of our spiritual awareness was firmly implanted. We also assigned prayer partners months earlier… each was given a name which was completely kept secret…until we revealed it at the going-away dinner on April 8th. We were tasked to pray daily for them and their pilgrimage. Joe Micatrotto at Hogar Ninos de Dios in Bethlehem with a volunteer from Italy. Yet, the most palpable spiritual awareness had yet to come. The first step was to board the plane on April 9th to Tel Aviv. 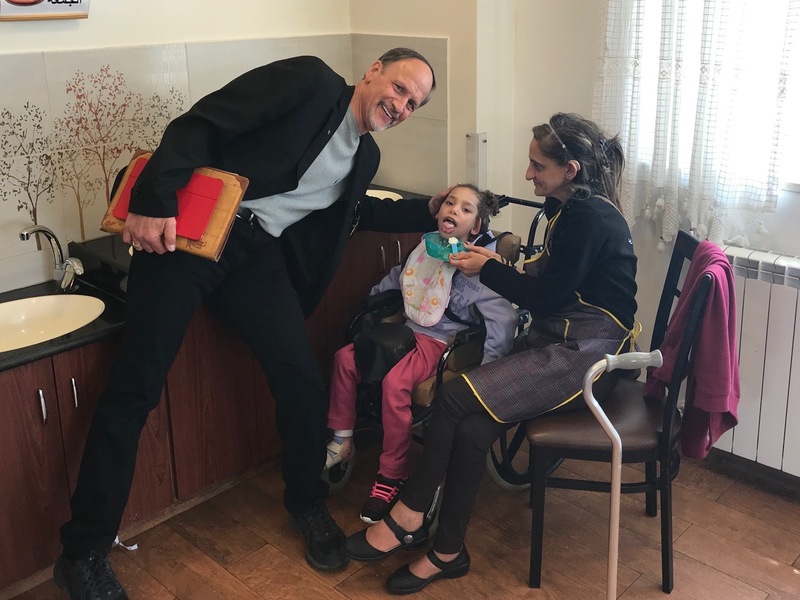 We actually arrived a few days earlier to adjust, set up and make a pre-visit day to Hogar Ninos Dios, a home for special needs children where the Incarnate nuns are supported by the Order. 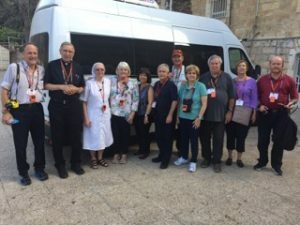 The greetings and welcoming at Israel’s Ben Gurion Airport and the next day’s drive to Nazareth (April 11th) were exciting and a bit taxing, but on the road to Our Mother’s Basilica of the Annunciation was where the spiritual invigoration arrived! Possibly the most touching moment came at Cana when Bishop Pepe gave an amazing message on our chosen life as married men and women and how that sacrament mirrors our Church as the Bride of Christ. Later that day, we gazed on the awestruck faces of the pilgrims as they viewed the Sea of Galilee. 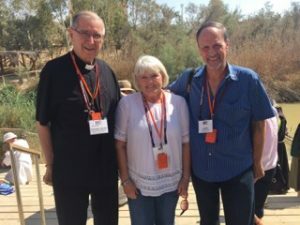 We spent three full days and nights in Galilee visiting Capernaum, riding the boat on Galilee, seeing and feeling the emotions at Peter’s Primacy. By day five, our “lucky” Friday the 13th, the jet lag was a thing of the past! Off to Caesarea Philippi, onto Mt. Tabor where the Mass’ gospel reading on the transfiguration took on a more graphic feel when the words “on the mountain” were allowed to be read as “on THIS mountain.” The reality and humanity of our Lord becomes as real as our own lives when we heard those words. We fondly remember Day six as we began the day with Bishop Pepe’s Mass at the Mount of Beatitudes…outside…and ending the day in Jerusalem. But, before we settled in Jerusalem, we visited Qumran and Cave #four of the Dead Sea scrolls fame. As we entered and viewed Old Jerusalem from atop the Mount of Olives, the expressions on the pilgrims’ faces were priceless. The imposing old wall, the shimmering gold dome of the Islamic Shrine, the peering top of the Church of the Holy Sepulchre…CALVARY! Funny, we can have a day in our lives when we literally can’t remember what we did…insignificant…and then we can have a day like Saturday, April 14th, when we entered the center of the world….Jerusalem! To most of us, April 15th is Tax Day, but to the 44 Steppers, this Sunday was local Catholic Church and Seminary Day. This was topped off with a visit behind the wall, to the Shepherd’s Field and the Church of the Nativity. Take that, IRS! What a joyful day. The Annunciation parish in Beit Jala welcomed us heartily and made us know that we are all brothers and sisters in Christ. However, they would not share the recipe for the chocolate cookie concoction they served to us after Mass! Our lunch at the seminary with the seminarians of the Latin Patriarch was made extra special because our own Seminarian, Louis Salman, joined us for the afternoon. He is now unofficially our third son! On to the Church of the Nativity. Some things like praying, touching and kissing the star on the spot where Christ was born is just not “word worthy” but must be physically experienced. From days eight to 11, we were based in Notre Dame Center, our hotel in Jerusalem, conveniently located across from the “New Gate” and made Old Jerusalem feel like our own neighborhood. While always aware of security issues, our pilgrims’ concerns dissipated day by day…we were far more concerned about each other’s well being. 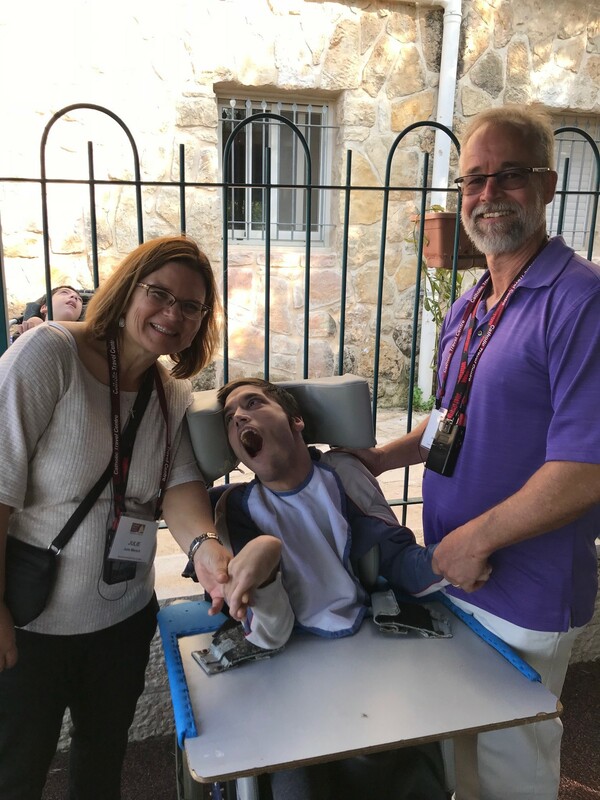 After having made four trips to our Lord’s Holy Land, we are often asked, “what is most impactful?”…wow, in just those past four days we visited Pater Nostra, Gardens of Gethsemane, Church of the Visitation, St. Vincent’s Home for Children, Mt. 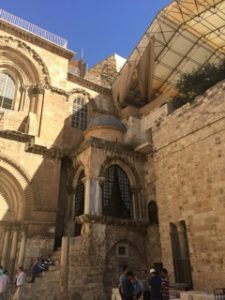 Zion, the Wailing Wall, Last Supper’s Upper Room, Church of the Holy Sepulchre…you can see the dilemma posed by such question. Yet, as Group Coordinators, we had that rare gift of being able to BE THERE and WITNESS the discovery of these most Holy places through the eyes of those seeing them for the very first time! Incredible! This experience has no parallel. When we heard “Oh My God!”, it was literal. On this pilgrimage something became very real and vivid to us both. Possibly because we had seen, felt and touched these precious sites before. The true humanity of both Jesus and His Mother Mary came through like a blazing fire. Going on a pilgrimage is truly a calling. You are very aware of the obvious…Christ’s divinity, suffering, resurrection and ascension. But for us, the Lord becomes alive as the person to be modeled. You feel things that at first you cannot believe but then you know that Christ felt and viewed these same things! And, for Mother Mary, we can see and feel her emotions as an earthly parent, not just queen of heaven and mother of God. She was flesh and blood, giving life to her child. 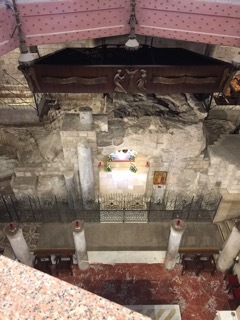 While standing about 20 feet from the Calvary’s split rock, watching our pilgrims kneel, touch and pray at this most holy site, it occurred to us…we are standing at about the same place where Mary watched her own son die on a cross. Yes, for mankind’s salvation, but none the less He was her own child. For us, this was one of “The” moments of this pilgrimage. Day 11 was magnificent, as we both felt like proud parents watching 13 KHS members receive the Pilgrim Shells at a special Mass at the Church of the Latin Patriarch. We were also excited that seven pilgrims will be invested and awarded with the Pilgrim Shells at the September 2018 Annual Meeting. Following a wonderful visit to Jaffa, we helped our pilgrims on their flights from Tel Aviv back to the USA. Our prayer that day at our own Lady Queen of Palestine Church was for a safe return and that they would all heed the message of the Ascension. Our Lord’s direction to us all, as His disciples, to go to the ends of the earth to teach and preach His words…for us today those ends are….San Diego, Los Angeles, San Francisco, Reno and of course, Las Vegas! Footnote….. “Plus One” yup, we traveled every moment with “Plus One”…Our Lord Jesus…we not only walked in His steps there, we also follow His steps daily in His love and graces. And yes, the tomb is empty. 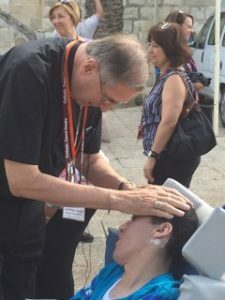 The old saying “not our first rodeo” would have seemed appropriate for the Catholic Travel Centre’s (CTC) Cardinal Mahony’s Holy Land Pilgrimage of October 4-10, 2014. After all, this was our third trip to the Holy Land in less than six years and we had “already” visited so many sites. Wrong! Oh, do not misunderstand; the first two trips were amazing, especially the 2014 CTC Pilgrimage. So, what transpired to bring the “29 STEPPERS” to a new level as pilgrims? Firstly, anyone’s trip to Our Lord’s “home base” is a private one on one experience. But, Cardinal Mahony made this trip not only unique, but also a Pilgrimage of Personal Spiritual Responsibility…PSR! It began three months earlier when we were beckoned to LA’s Cathedral of Our Lady of the Angels for a group meeting to review this pilgrimage and what to prepare for. Also to make us realize that we were visiting the Holy Land NOT as tourists but as TRUE pilgrims and to act as such! We received the daily prayer and spiritual guide books personally prepared by Cardinal Mahony. The guide book contains specific readings connected to each location to be visited. The readings relate both to the days of Christ and their relevance to our current walks with our Lord. We were given 10 books each so that we could bring “prayer partner pilgrims” to spiritually travel with us. 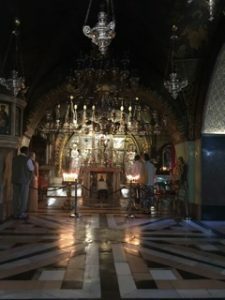 Our pilgrimage covered in detail the key sites: three days around the Sea of Galilee and six days throughout Jerusalem and surrounding areas. 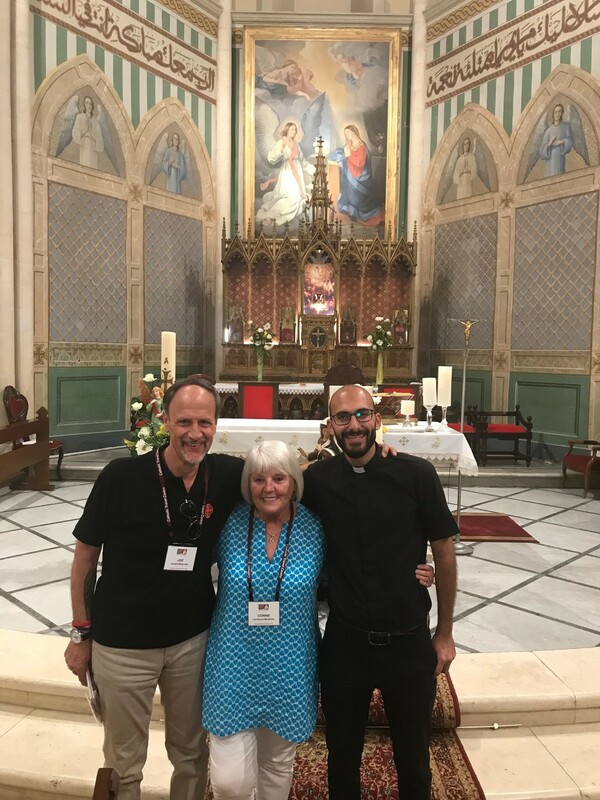 To detail our total experience would be a tremendous task, because as St John the Apostle said, “so much to write that I doubt there would be enough volumes to hold it all.” However, here are highlights that made the pilgrimage a very memorable Holy Land trek. October 6th, day one. Mass next to Our Lady’s home of Annunciation in Nazareth. It’s not only where Mary’s beginning of motherhood took place, but also where our own enlightenment commenced. October 7th, at Mt. Tabor for Transfiguration Mass. We saw a large group of Nigerian pilgrims dancing in praise of our Lord, joined by Father Ken and Sister Kathy! Here, and at other locations, Cardinal Mahony was asked for blessings and pictures. He was a true Rock Star! October 8th. We all got a good Baptist dampening at the Jordan River by Cardinal Mahony. October 9th. One of the most energizing days at the Seminary in Jerusalem. Our Order sponsors 100% of these wonderful seminarians and they are so grateful. The fabulous meal they prepared for us made it clear they know their culinary ABC’s! October 10th. Cardinal Mahony gave us the very rare opportunity to be alone and meditate in a completely private area of the Garden of Gethsemane. If there was a soul searching moment, this was it! Not to be missed on this same day was the 29 STEPPERS’ visit at St. Vincent’s in Ain Karem, another children’s home supported by the Order. Ask any of us to describe what we experienced, including the gentleness of Cardinal Mahony’s individual blessing of each child, without tearing up….IMPOSSIBLE. October 12th. A most joyous day! Highlighted by six Area Councillors receiving their Pilgrim Shells. Fr. Pizzaballa, the Apostolic Administrator of the Latin Patriarchate, awarded the Pilgrim Shells to the Brehm’s, Luchetta’s and Schanzlin’s. All 29 STEPPERS witnessed this blessed achievement, the highest form of honor granted by our Order. At each new day, we were drawn very close to Our Lord and his Living Stones and to our Catholic Arab family and community. 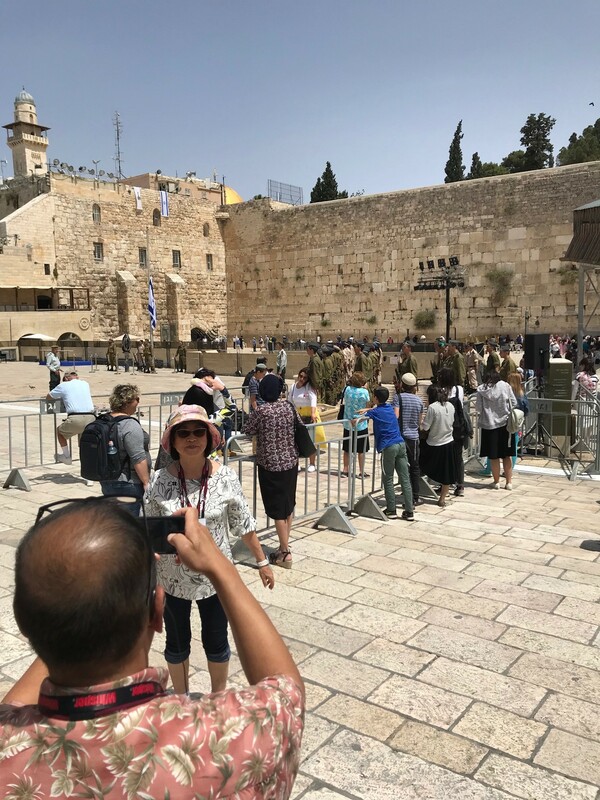 Space for this article is limited but when you visit and pilgrim your way through the Holy Land, you have unlimited space for all the Lord’s blessings. 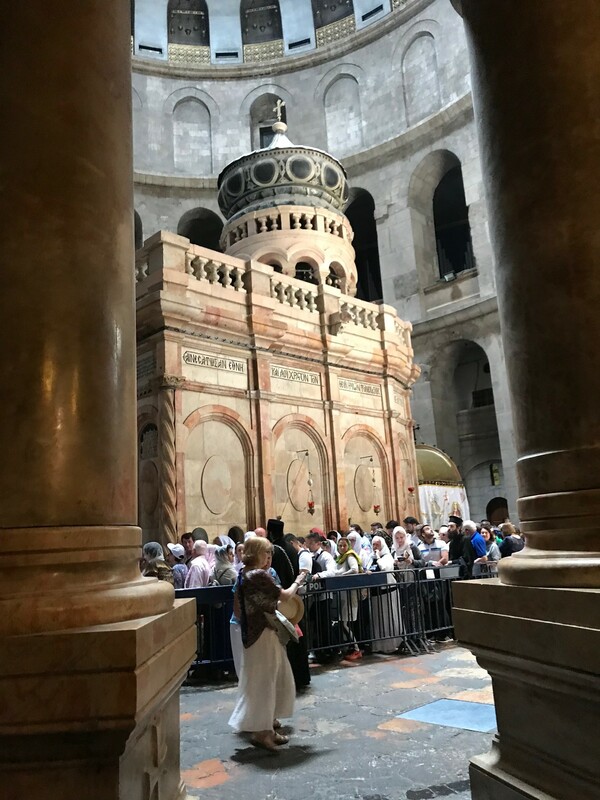 As Knights and Ladies of the Equestrian Order of the Holy Sepulchre of Jerusalem, a visit to the Holy Land is really a MUST. As adults, how many of us would love to go back in time and see, touch, taste and experience what our parents and ancestors did as children growing up? What type of teenagers were they? What type of neighborhood did they grow up in? What environment helped to form and affect their lives? When you become a pilgrim Stepper, you will see how our Lord did just that; you will see, sense and feel his true and real presence. At Calvary, we had an incredible opportunity to spend quiet time at the site of the foot of the cross. As we crouched down on stone steps in deep meditation, next to Cardinal Mahony, we kept repeating …”Thank you Lord”…We were both imagining that 2000 years ago, at this exact location, our Blessed Mother, her companions, and St John were mourning the death of our Lord Jesus. We had 2000 years of praising and thanking him for coming as our Emmanuel! God’s Blessings to You and Those You Love.